Rankings are based on input from players and team managers from all 16 competing nations, and broken into 9 categories. The Vancouver tournaments’ overall victory was the result of having the highest category score in five of the nine categories that span elements of player welfare, including travel, training facilities, liaison officers, and medical support. 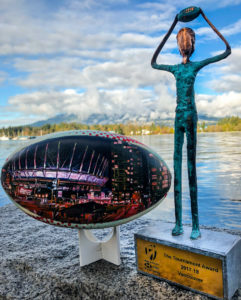 The 2019 HSBC Canada Sevens in Vancouver will take place on March 9th and 10th at BC Place Stadium. To date, only General Admission tournament passes remain, and with the first day of competition selling out last year, fans are encouraged to purchase their tickets early by visiting Canadasevens.com. The HSBC World Rugby Sevens Series action, including the Dubai Sevens this weekend, can be found at cbcsports.ca. For the full television and live-stream broadcast schedule, visithttps://www.cbc.ca/sports/broadcast. HSBC Canada Sevens is a two-day indoor rugby sevens tournament, hosted March 9–10, 2019 at the world-class BC Place Stadium, host venue to Canada’s most prestigious events, featuring 16 of the world’s top men’s sevens teams. HSBC Canada Sevens Vancouver is the sixth stop in a 10-stop world tour as part of the HSBC World Rugby Sevens Series. Sevens rugby, a fast-paced and shorter version of traditional rugby with only seven players per side, has built a huge international audience through the success of the HSBC World Rugby Sevens Series, which attracts large audiences in markets around the world. The 2019 HSBC World Rugby Sevens Series kicked off November 29th in Dubai, and the full ten-stop tour schedule of the 2019 Series can be found at www.worldrugby.org/sevens-series/calendar.